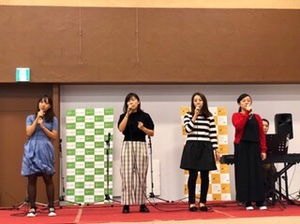 A praise bands of Yokkaichi Zion church held a gospel live at Lala square Apita Yokkaichi. 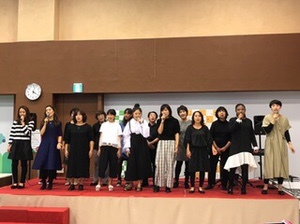 Many people were playing in the venue called “Wakuwaku Fureai Square”, they were waiting the live to start saying “We want to listen soon” Seven groups, kids group to adult group sang 8 songs, gospel was reverberated in the venue, and the deep presence of the Lord was overflowed. Two young gentlemen were listening earnestly till the end, and said “I was touched by the word of the songs! It was very good. I will come again next time”. And one Lady told us “Songs came into my heart, and I was healed!” Some family with children said “We were listening rapt attention. We will come again.” We give thanks to the Lord touched each one! 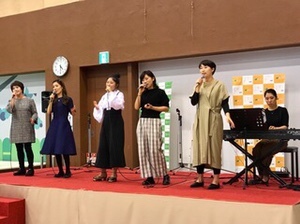 A praise bands of Yokkaichi Zion church held a gospel live at Lala square Apita Yokkaichi. Seven groups, kids group to adult group sang 8 songs, gospel was reverberated in the venue, and the deep presence of the Lord was overflowed. Two young gentlemen were listening earnestly till the end, and said “I was touched by the word of the songs! It was very good. I will come again next time”. We give thanks to the Lord touched each one!